Social media has become ingrained in our society. With 60% of Australians now on Facebook, that means that nearly every customer that walks into your pharmacy has a Facebook account, and the average person with a Facebook account checks it up to 8 times throughout the day! By building an online presence and promoting your pharmacy on Facebook, you can reach current and potential customers every time they open their app. Foster the relationships you have with them, build trust, increase your health authority and drive them into store, all for a fraction of the cost of traditional print media. Our team of digital experts specialise in marketing within the pharmacy sector, and we know it’s important that independent pharmacies focus on their biggest point of difference – community. instigo’s digital marketing team can help you analyse your audience, develop a social media strategy to suit them, and deliver custom content to engage and grow your community before they have even set foot in the pharmacy. To find out more or discuss tailored social media solutions for your pharmacy, call us today. Katanning Pharmacy is located in a small town in Western Australia. They previously had a Facebook page, but it was not kept up to date or being utilised regularly. Katanning saw the value in social media to reach their small community, but found it difficult to find time to come up with content or set aside time to post. The instigo monthly Facebook Engagement Package. The package contains page updates, a planned monthly posting schedule, store branded content, and ongoing training and support for pharmacy staff. This ensured the page had regular and fresh content aligned with pharmacy promotions and health solutions. With instigo posting professional content it created a better experience for the audience and gave the pharmacy more time to spend with customers in store. Since October 2018, Katanning Pharmacies Facebook page has seen a large jump in likes growth, and seen a rise in the amount of engagement their posts receive without any Facebook funded advertising. 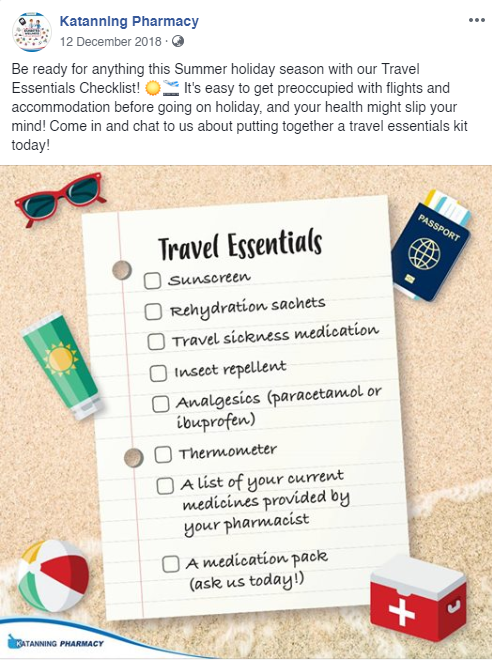 Katanning now consistently posts from within the pharmacy as well, sharing personable photos of staff and competition winners to compliment the professional content designed by instigo, creating a healthy stream of content for the community. Katanning Pharmacies page is still consistently growing, and they now have a well-established platform to connect with their wider community. Scott Dibben Chemist in Kotara Westfield Newcastle have a Tresillian Baby Nurse available in-store who attends the pharmacy weekly to do baby health checks and provides information to new mothers. Scott Dibben Chemist saw the value in this, and wanted to increase awareness of the service and grow the customer base. Foot traffic was low due to a major renovation in the Westfield centre over the past 18 months. We needed to avoid alienating existing audiences who would not find the information valuable or relevant to them. We needed to substantially increase appointments for the Baby Nurse. We identified the target audience and where they were likely to hang out; New mums aged 20 to 35 located within a 10km radius of Kotara Westfield on Facebook. instigo set up and built a Facebook Group, this was the most cost efficient and effective way to raise awareness of the service in the community with the target audience. It created the opportunity to provide bespoke content to a narrow audience and create a more personal connection with existing and new customers. The Facebook group provided a forum for likeminded Mums to connect with not only health support but with each other. The post was seen over 3000 times and the comments were inundated with positive feedback. The ever-changing Facebook algorithm rewards businesses receiving positive engagement by ranking them higher so this provided a competitive edge over other pharmacies in the area. The group quickly amassed over 300 loyal members and has organically grown the in-store clientele of the Baby Nurse. 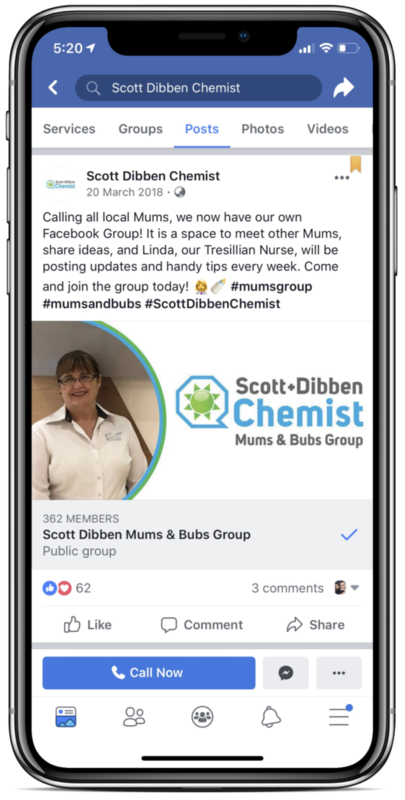 Scott Dibben Chemist now have a valuable channel to generate new customers and connect with loyal customers well after they have left the store. Tasmania typically has about 6 cases of meningococcal disease per year. In July and August there were 9 reported cases. Meningococcal disease can be fatal with rapid symptom onset. The Tasmanian Government authorised trained pharmacists to administer the Meningococcal Vaccine for free to children between the ages of 10 and 21. Support the Australian Government in their health message to get vaccinated. Speed to get the message to market was critical. Be prepared for any anti-vaxxer activity. We considered channels and determined that Facebook would support the speed of getting the message to market. instigo created a post that was clear and easily delivered. It had a simple message to “Stop Tasmania’s Meningococcal outbreak in its tracks!” and a clear call to action “Contact us”. To maximise the reach of the message and the speed it could be delivered, the Facebook tile was boosted to a hypertargeted audience within a 10km radius of Claremont Pharmacy. As a secondary message we also grew awareness of the general EasyClinic services that Claremont Pharmacy now offer. instigo prepared a response to anti-vaxxer comments and monitored comments regularly and vigilantly while the post was boosted. The post reached 9,231 people, and was shared 40 times. 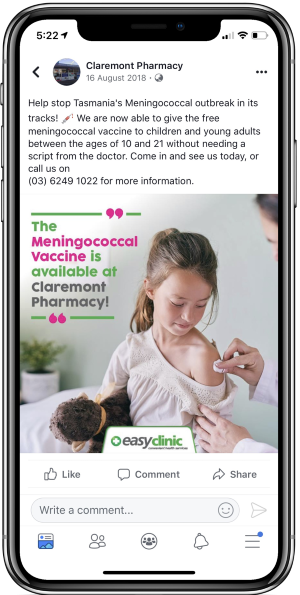 Due to the nature of the outbreak, most of the meningococcal vaccines in the Claremont area had already been vaccinated by the Department of Health and GPs before pharmacists were approved to vaccinate. However, Claremont Pharmacy did still manage to administer 20 vaccines in the community. The post was the beginning of the awareness drive for vaccination services and their Facebook following increased by 10%.